At the north of Brunei Bay and facing the South China Sea is the island of Labuan, an international offshore financial centre and Malaysia's only deep-water anchorage. 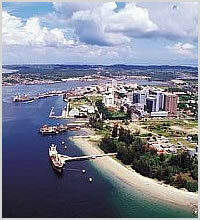 Declared a Federal Territory on 16 April 1984, it lies 8km off the coast of Borneo adjacent to the state of Sabah. Labuan comprises of Labuan island and the six islets of Rusukan Kecil, Rusukan Besar, Kuraman, Daat, Papan and Burung. The main attractions of Labuan are wreck diving, sport fishing and duty-free shopping. There are four fascinating wrecks in the seas surrounding Labuan, making it a highly rated diving destination in the region.